Regal High Yield pickling cucumbers are an early, semi-dwarf variety (a gynoecious hybrid which means that the plant only has female flowers that produce seeds but no pollen) that produce continually all season long. These dark green, stippled cucumbers are slightly tapered which makes them ideal for pickling chips, spears and whole pickles. Pickling cucumbers can be picked when they are 2-4″ long. Pick cucumbers by turning cucumbers parallel to the vine and snapping off with a quick snap. This prevents vine damage. Days To Harvest: 52 from seed. 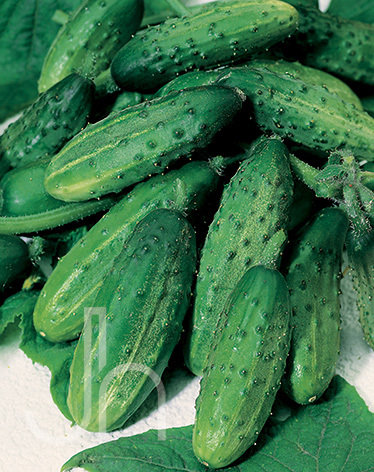 Outstanding Features: Regal Pickling Cucumbers are very easy to grow and are an excellent choice for home gardens. Pick cucumbers when fairly young to avoid bitter skin. Although the cucumber has a higher water content than most vegetables, you can increase its nutritional value by serving the cucumber without peeling it first. Tips: When the cucumbers mature and are ready to be picked, picking them regularly instead of leaving them on the vine will keep the plants producing new cucumbers longer. Harvest cucumbers in the early morning and they will be more crisp.